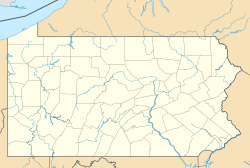 Rosemont is an unincorporated community in Pennsylvania on the Philadelphia Main Line between Bryn Mawr, Pennsylvania, and Villanova, Pennsylvania, lying partly in Radnor Township, Pennsylvania, and partly in Lower Merion Township, Pennsylvania. Part of the geographic area is served by the Bryn Mawr, Pennsylvania, ZIP code. Rosemont is served by its own stops on both the Paoli/Thorndale Line of SEPTA Regional Rail and the Norristown High Speed Line. The community of Garrett Hill is in Radnor Township and in the Rosemont section. The Joseph Sinnott Mansion was listed on the National Register of Historic Places in 1980. The neighborhood of "Beaupre" in Rosemont was once the 200-acre estate of the same name, built for Alexander Cassatt's son, Robert. The original mansion still stands and is part of Rosemont Presbyterian Village, and the original French iron gates flank entrances from Conestoga Road and South Ithan Avenue. Pupils living in the Radnor Township portion of Rosemont attend schools in Radnor Township School District, while students in the Lower Merion Township portion attend schools in the Lower Merion School District. Until 1980, the Radnor Township, Delaware County portion of the community was served by Rosemont Elementary School, located in the Garret Hill neighborhood of the town. The Rosemont Business Campus now stands on the former elementary school site. Children in these neighborhoods are now bused to the Radnor Elementary School. Holy Child School at Rosemont (formerly Rosemont School of the Holy Child), located in Rosemont and in Lower Merion Township, is neither affiliated with nor governed by the Roman Catholic Archdiocese of Philadelphia. The school is adjacent to Rosemont College. The Agnes Irwin School is located on Ithan Avenue in Rosemont. It is an all-girl, non-sectarian, day school for PreK-Grade 12 founded by Miss Agnes Irwin and her sister Sofie. The Roman Catholic Saint Thomas of Villanova Parish run by the Augustinian Order also ran a parochial school, which closed in the 1980s, adjacent to their Rosemont chapel and serving the Rosemont community. Rosemont College is in Rosemont on Montgomery Avenue at Curwen Road. This page was last edited on 8 December 2018, at 05:29 (UTC).